Hendrick might be credited with a goal too maybe, his shot definitely looked on target before being diverted in. That said, Shane Long's may well have been off target. When was the last time we had four goalscorers? If it wasn't for bad luck, Rob Elliot would have no luck at all. Last week, Derby Co. were reportedly having a look at him. Now, according to the Evening Chronicle, he has sustained a back injury and NUFC's hopes of selling him "have gone up in smoke with the player potentially requiring an operation". Elliot is on contract until June 2020, but Benitez wanted to off-load him. 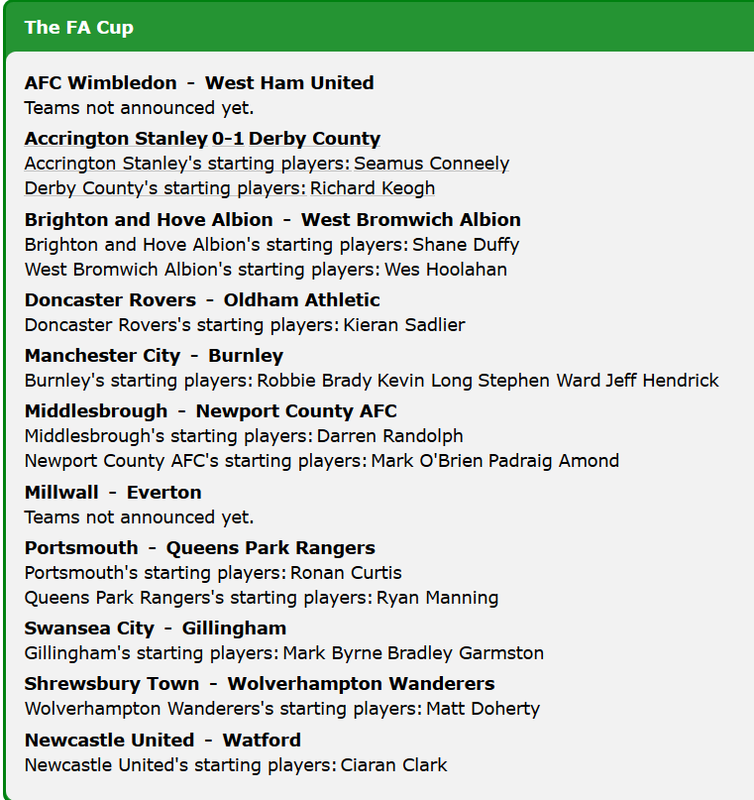 Unusually, no Irish substitutes in the FA Cup today, i.e everyone starts. Millwall's Irish international Shaun williams and his FAI cup winners medal with Sporting Fingal. needless to say Kevin had not got a clue about Sporting fingal,never heard of them nodoubt. So what if he hasn't? I reckon I'd know people in Dublin who have never heard of Sporting Fingal. Is this a new gut test for second generation players - unless they know all the defunct LoI teams of their lifetime they should be looked on with suspicion? Anyway, can you imagine the damage to the league's reputation if Killer's answer had included words like vanity project, wild west regulation, developers, bankrupt, crazy league, only one of many, and (the shame!) happened on John Delaney's watch...? Keenan bagged a hat trick then today for Hearts' reserves. One to watch. A hat-trick for Simon Cox, earning a draw for Southend, who were 0-3 down to Portsmouth. He has 65 league goals according to Wiki, and 74 club goals in total. It's not great really is it, for a player of his type?